Debut author, Emily Kerr's novel was published yesterday, so we thought we'd catch her and pop her in the hot seat for a few questions. Hi Emily. Congratulations on the publication of Who Does He Think He Is? Please tell us all about it. I find inspiration from all kinds of places. Sometimes I’ll overhear a random snippet of conversation and it can spark the idea for a story, or I’ll read something in the news or hear a random fact and they’ll get me thinking. I always carry a notebook with me and scribble these things down. I know they’ll come in handy one day! I don’t really have an ‘average’ writing day as I have to try and squeeze my writing in around my day job. I’m a journalist and work quite crazy hours (as a colleague once said, it’s more like a lifestyle choice than a career!) so it can be challenging to fit everything in. However, I’ve developed something which I call the ’43 minute rule’ to keep myself in line. I realised that the average length of an episode of the TV shows I love to watch on Netflix was around 43 minutes. I decided to ditch the 43 minutes of Netflix watching, and spend that time writing instead. I find if I turn my Wi-Fi off, put my phone on silent and really concentrate for 43 minutes, I can get a fair bit of writing done. And more often than not, I’ll get really into my story and carry on scribbling away even when the 43 minutes are up. This is a really tough question! Am I allowed more than one?! I return to Persuasion by Jane Austen over and over again. I admire Anne Elliot’s quiet strength, and Captain Wentworth’s letter gets me every time. Gaudy Night by Dorothy L. Sayers is another favourite. I first read it when I was at university so it always takes me back to that happy time. The protagonist Harriet Vane is also a superbly drawn character, and I am completely in love with Lord Peter Wimsey. And for something completely different, a cartoon book of the Greek myths means a lot to me because it first sparked my fascination with the ancient world, and I suppose was an early influence on my choice to read Classics at uni. I grew up in Yorkshire not far from Haworth and so the Brontë sisters have always inspired me. From their small village, they wrote stories that have a far-reaching impact. They didn’t let society’s expectations hold them back. The best bit of being an author is the actual writing! The characters in my story become as real to me as my own friends and family, and I find myself thinking about them and in fact missing them when I’m not writing about them. The sense of camaraderie among authors is also wonderful. I can’t believe how generous and supportive other writers have been towards me. As for the worst bit, I suppose it’s the fear that comes in sending your work out into the scary big wide world of publishers etc and waiting to hear back. I spend a lot of time daydreaming about my characters, putting them in different scenarios in my head and seeing what happens. That means when I sit down to write the first draft, I generally have a sense of where the story is going, and what needs to happen when and why. However, apart from maybe a few scribbled notes to remind myself of these things, I don’t have a formal plan written down. I just tend to dive in and allow the story to evolve. I like being surprised by the things the characters end up doing! I get more disciplined during later drafts and will take quite a few passes through the manuscript ruthlessly cutting, re-writing etc before giving myself some time away from it working on other projects, so I can return and start the editing process with fresh eyes. I’ve always wanted to be an author, and some of my earliest memories are of sitting in the back of the car on the way to primary school asking my mum to spell out words for the stories I was writing. Ever since then, I’ve tended to have several writing projects on the go at once. I had a terrible habit of writing thousands of words of one book, then moving onto a shiny new story and not finishing it. 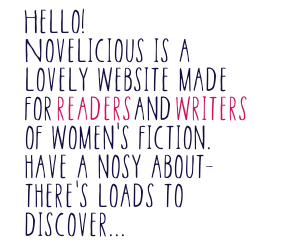 Joining the Romantic Novelists’ Association New Writers’ Scheme encouraged me to focus on one particular story, my book Who Does He Think He Is? and actually finish it. The advice and support from my reader was invaluable. I entered writing competitions and placed or was shortlisted in several. That success helped me to find the courage to submit my book to publishers. Just go for it! Don’t allow the fear of not being able to do it take over and stop you from trying. Get the words out on the page and don’t worry too much about it. Once that first draft is done, you can go back through and re-write and edit to your heart’s content, but you need something to start with. I would also recommend the Romantic Novelists’ Association New Writers’ Scheme as a wonderful way of getting constructive advice and guidance from published authors. Katy Colins is a debut author with a fascinating and uplifting route into writing. Her first book in The Lonely Hearts Travel Club series is out tomorrow! Destination Thailand is the first novel in the Lonely Hearts Travel Club series out on January 21st 2016. It follows recently jilted bride Georgia Green who is disillusioned with the way her life has become and is encouraged to revisit her childhood dream of seeing the world before mortgages and dull dinner parties got in the way. But she soon discovers that the path of going from lost to wanderlust may not be easy but it sure is fun. Destination Thailand has been described as Bridget Jones goes backpacking and is perfect if you’ve decided to make 2016 the year you stop wandering and start wandering. I have also just finished the edits for the second novel Destination India and am giddy with excitement to get going on the third book Destination Chile in the next few weeks. Destination Thailand was loosely based on real life events that happened to me. I was a jilted bride with a deep desire to travel and see more of the world than the life I was living. It was only when my big wedding was called off that I gained the courage to grab my passport and head off on my own adventure. I wrote this novel as I was backpacking around South East Asia and South America mostly as a way to work through my emotions, never allowing myself to believe it would end up as a novel but I just felt that I had to share Georgia’s journey including the highs and lows of being a broken hearted backpacker. Travel is the main thing that inspires me as I try my hardest to describe the places I have seen in such a way that I hope I make readers feel like they are there without leaving the comfort of their homes. Like with most things in life (cake and wine – I’m looking at you) I'm an all or nothing type of girl. I wish I wrote every single day but I prefer to block an entire day or days off and write from dawn to dusk only surfacing for food and to check we haven’t been taken over by a zombie apocalypse since I’ve been locked away. Obviously this isn’t always feasible but it has worked so far for me. Gah there are so many! Probably the most influential women’s fiction book I read was P.S I Love You by Cecelia Ahern. After reading this ten years ago I felt compelled to write her a letter (twitter wasn’t around back then) telling her how much I loved the story and if she had any writing advice for an aspiring novelist. Amazingly she sent me a hand written letter (on pink notepaper!) sharing her tips. I will always cherish her not only taking the time to reply to me but also the seeds that letter planted in my mind that one day I could make my dream a reality. Again there are so many wonderful and inspiring female writers out there. I think in terms of my genre I would have to say both Lindsey Kelk and Kirsty Greenwood inspired me to see humour and awkwardness as positive relatable parts of every women’s life. I love reading about main female characters that have loo roll trailing from their scuffed heels or blurt out cringy things without meaning to as I identify with women like that and those ‘oh gawd this could so be me’ moments. This is something I aim to show in my novels creating the type of characters that you want to hang out with, get drunk with and share a kebab with on the way home. What books have you been recommending recently? I’m a bit behind on my reading list as I have been so busy meeting tight deadlines so most of my recommendations are probably a little behind the times. However, I got my aunty hooked on Elizabeth Is Missing and I tell anyone I meet that they need Jessica Beam in their life from The Vintage Guide to Love and Romance. They say that writing is a learning curve and I couldn’t agree more. It took me a year and a half to finish Destination Thailand and it went through a ridiculous amount of edits from first person to third and back again, duel narrative and back again and thousands of scrapped words as I found my voice. Although looking back I really needed that time and the freedom to play around with it until I felt confident enough to send it off to agents and publishers. I only had three months to write my second novel Destination India so armed with a detailed synopsis and the knowledge I’d learnt from writing my first book I dove straight in and two fairly straightforward drafts later I’m really pleased with the current outcome. I have always had a serious crush on English and creative writing from a young age luckily spurred on by a supportive family and inspirational English teachers at school. I studied English and Journalism at university and dabbled in both public relations and journalism for a few years before realising I didn’t want to write stuffy press releases but rather the sort of books which I wanted to read: full of awkward heroines, exotic adventures and hot love interests. After sending out Destination Thailand to agents I received a lot of positive interest but they ended in polite no’s which is when I sent it out directly to publishers. I received the call from a lovely editor at Carina ironically on the date of what would have been my third wedding anniversary and signed a three book deal with them! Write the book that you want to read, don’t fall for fads or try to write something you think will sell at that moment as it will pass. Remember this is a marathon not a sprint, you need to write because you love it and put in the many hours needed to create what you are proud of. Hang out with people who will inspire and support you, whether that is online or in real life as they will be your biggest cheerleaders but make sure you return the favour. Celebrate every milestone, not that I ever need an excuse for a party but it is good to take a step back and realised how far you have come. I have a few more rounds of edits for novel two, Destination India, but I’m already feeling so positive about this book even at this early stage which is such a lovely feeling. I am then jetting off to the Philippines to lock myself away in a beach hut to write my third novel Destination Chile. I do have very itchy feet so getting to travel, write, and write about travel is just the most perfect career for me! Maggie Ritchie's first novel, Paris Kiss, is out in February and is based in Bohemian Paris in the 1880s. It's the story about a young English sculptor Jessie Lipscomb who joins her friend Camille Claudel to become the protégée of the great Auguste Rodin. When Rodin and Camille embark on a scandalous affair, Jessie ends up as their unwilling go-between and their friendship unravels. Years later she finds Camille in an asylum and discovers an explosive secret. If I haven’t had time to write during the week, I go to Glasgow University library on Saturdays and write for four hours. But I usually try to steal at least one or two days from my work as a freelance journalist and keep the weekends free for family. I’ve tried to base characters on people I know but they never turn out as interesting as the made-up ones and I have to ditch them. Sometimes, when I’m trying to create a male character, I’ll have a picture of Charles Dance or the young Terence Stamp in my head as a starting point, but they soon become their own people. Nancy Mitford’s Pursuit of Love is the original rom-com with a cast of eccentric characters modeled on the author’s own potty upper class family. Set in the 30s and 40s, it’s a comic tale of Bright Young Things and their search for love. I’ve read this charming book time and again – and the ending always makes me cry. I’ve learned to plan. I dived straight in with my first novel, Paris Kiss, and about halfway through I realised I needed a plan. I ended up rewriting the novel three times to sort out the mess. I meticulously planned my second novel and thought about character, point of view and structure much more. It’s 1727 and Tom Hawkins, a 25 year old well- educated son of a clergyman, has pushed his luck too far in the gambling dens of the seedier side of London, ending up in the Marshalsea debtor’s prison. He soon discovers that he is to be sharing a room with Samuel Fleet, a loathed and dangerous man, who many suspect of murdering the previous occupant of their room, Captain Roberts. The Captain’s sudden death was made to look like suicide. Or was it? Captain Robert’s beautiful wife is determined to seek vengeance for her husband’s murder. Unable to pay off his debts and determined not to die in this hellhole, Tom agrees to investigate the Captain’s death, find the murderer and put the matter to rest once and for all. The book starts well with a dramatic prologue that intrigued me. The depiction of the gaol was vivid and obviously very well researched and the horror of being kept in such a place made only too real. The prisoners’ fear of ending up on the Common side, where escape seemed only to come inside a wooden box, was brilliantly written, as were the different characters from the cruel viciousness of Samuel Fleet, the kindness of Kitty the servant girl, and the unspeakably vile prison governor. An added intrigue for me was that this story was based on diaries from inmates of that prison 300 years ago. I did though find that my interest waned a little during the first 100 pages when, after the initial drama, the plot didn’t seem to progress as much as I’d hoped. However, the story did heat up once again, as Tom coped with continued horrors, trying his best to work out who was responsible for the Captain’s death. The latter chapters had me trying, and failing, to guess the outcome, the ending was shocking and I didn’t see the final twists of the story coming at all. Gillian Binchy's debut novel, Ruby’s Tuesday, was recently published in Ireland by Poolbeg Press – A Ward River Imprint. Today, Gillian has popped over to answer a few questions about the heartbreaking inspiration behind her book, her famous relative and much more. I wrote Ruby’s Tuesday in less than three months. I put pen to paper during the summer of 2013. The novel was motivated and inspired by the loss of our daughter Zeldine. I began it in late May and finished the second draft the day before I returned to work in mid-September. I wrote from early morning until late at night. I was obsessed with my daily word count, 3,000 words a day was my target. I wrote like a possessed woman! Every day with the allocation of words complete, I would then edit the content that I had written the day before. Never deleting content I had written. In the early stages of a novel you are not sure what will and won’t work so I found it best to shy away from the delete button until the first draft was fully complete. Gillian Binchy has signed a three-book deal with Poolbeg Press – a Ward River Imprint – and her first book Ruby's Tuesday is out now. Next Thursday, we'll be finding out more about Gillian, her debut novel, the inspiration behind it, her famous literary relative (Irish novelist Maeve Binchy), and much more. Today, Gillian is telling us about her book deal moment. It was early on a Saturday morning in October 2013; I was getting ready for a swim, an unknown number appeared on my phone. Hesitating, I answered it. The lady, she said that she was calling about the book, about my novel, that they were very interested in the story. She was clear concise and adamant that it be a three book deal. She was calling from Poolbeg Press, her name was Paula Campbell. I liked her instantly. By now I had returned to my day job, life slowly had seemed to take on a new version of reality. A very different reality from before. Laughing, I told her that I hoped that there would not be another two tragic novels in my life. I asked her would a one book deal not be better – that I had no idea whether I could actually write another book. The lady was firm but very polite, No, it would need to be a three book deal. It would need to be edited and they hoped to publish it early in 2014. ‘Okay,’ I said not really sure if it was okay or not. The book was my legacy for our daughter Zeldine Binchy Smith, but did I really want the whole world to intrude on my story of our heartache? I was torn – temporarily. Did I really want it to be published? Then, I told the lady with the clear and concise voice that yes I was thrilled for them to publish it – to publish all three of them. I think that was what I said anyway. Carol K Carr recently popped over to tell us about her debut novel, book one in the Madam of Espionage Series: India Black, which tells the story about the consequences – both hilarious and dangerous – of running a brothel in Victorian England. I’ll be with you in just a moment. I’m looking at cat pictures on the internet. Where were we? Oh, yeah. My writing day. I’m incredibly disciplined about writing, and I follow a rigorous schedule. I get up around 6:00 and read the news online while I drink coffee. At 8:00, I go to the gym. Then I come home and watch a few music videos. I’ll start writing around 10:00 or 11:00 and work for a couple of hours. Lunch is a protein shake, usually, and then I’ll finish my word count for the day. I’ll check something briefly on Wikipedia and emerge an hour later. I’ll do some marketing, like guest posts for blogs. Visit Facebook. I’ll answer my email, catch up on the news. More cat pictures. Hey, I haven’t checked Twitter yet! I might do some research for a scene I’ll be writing later. I’m finished by 5:00 and usually congratulate myself on surviving another grueling day by having a glass of wine or a gin and tonic. And I don’t always look at cats. Sometimes I look at pictures of puppies. I certainly use people I know, although they wouldn’t recognize themselves. I’ll steal something from them: the shape of their face, a phrase they’ve used. Maximus, a friend’s Pekingese, made a guest appearance in my third novel. I borrowed my friend Dave’s last name for the Duke of Litherland in the same book. I may see a person’s photo and think that his physical characteristics would look dandy on a villain. But it’s not easy transforming people you know into fictional characters from the Victorian era. Modern sensibilities, language and appearances differ so much that you can’t incorporate them easily into historical fiction. Readers are very quick to notice those kinds of inconsistencies. Jane MacKenzie's debut novel, Daughter of Catalonia, was published in April. Jane is lucky enough to split her year between the Scottish highlands and her dream home she built in Collioure, French Catalonia. Today, she's telling us a little about her book, set in beautiful French Catalonia in the years following the Second World War, and her route to publication. I split my year between a beautiful town in the Catalan region of southern France, and the family home in the Scottish Highlands. My routine doesn’t change much, though, from one place to the other. I’m an early riser, and I like to spend an hour answering emails and getting odd jobs out of the way, and then by around 8.00am I’m reading through the previous day’s work before I begin writing. How long I write for depends on what else is happening – book signings etc and I still do some consultancy work for the UK government promoting science (I worked at CERN, home of the Large Hadron Collider, for some years). But I try to write at least 1000 words a day, often more, writing for a full morning at least. No. My books are set in the past, and in sunny Mediterranean locations, and my characters are truly imagined, but based on a lifetime’s interest in people and what shapes and motivates them. There are so many! But when I read the question one popped into my mind instantly, and that’s Gaudy Night by Dorothy L. Sayers. I love her writing style, and the way she combines the genres of detective fiction and romance, all written with a fine literary hand. Who wouldn’t fall in love with Lord Peter Wimsey? In Gaudy Night he finally wins the woman he loves, and it’s a book which warmed my heart. When a debut author signs a massive six-figure book deal with a publisher, has the film rights bought almost immediately and is likened to JK Rowling, it would be wise to pay attention. Especially when that author is barely in her twenties. The Bone Season by Samantha Shannon is a breathtaking and enthralling debut from the young novelist about a world within our own where clairvoyants are shunned from everyday society. 19-year-old Paige Mahoney is one of the more unique clairvoyants – a dreamwalker who can enter the dreamscapes of others via the æther. Having moved to the relative safety of the criminal underworld, Paige is ripped from the life she knows in London to a whole new world in Oxford. There, an alien race called the Rephaim are in control and have been afforded their own prison colony of sorts. As part of this colony, they have also been given the right to capture clairvoyants and use them as they see fit. In exchange, they protect the population at large from the threat of the Emim – mysterious and beastly creatures who threaten both races. Carol is stuck in an unhappy life. Married to a man she no longer loves and suffering a hostile relationship with her daughter who she no longer understands, she is looking for escape. Ready to leave and crippled with guilt at her decision, she vents out her feelings by writing it all down in a letter addressed to no one. A letter she thought would never be read, detailing her most inner thoughts and emotions, addressed with just a smiley face for direction. Albert is a lonely postman on the verge of retirement, widowed with only his cat for company, his job is his life and that is sadly coming to an end. For his last days at Royal Mail he is left to sort out the mail which is undeliverable. It is then that he spots a number of letters with a smiley face drawn where the address should be and intrigued, he opens them and begins reading. So begins the relationship between these two strangers, the novel detailing how Carol's letters influence Albert and how she finds her own direction from writing down her feelings. I don't have one particular place where I write, it could be the kitchen table, or in front of the fire at home, or in one of several spots around Jersey. This is a picture of me at a hillside park in St Brelade Bay. The park overlooks the beach where I've set the beach polo scene in A Jersey Kiss. If this view can't inspire me then at least there's always something to look at while I try to think what to write next.